HTC is very confident it knows what you want. 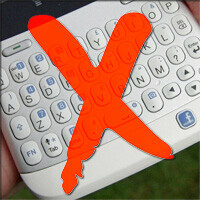 In addition to thin models, HTC is also reportedly done with QWERTY keyboards on its smartphones. The folks over at Pocket-lint are reporting that, at the Frequencies event in Seattle, HTC’s design team made it clear that they are moving away from physical keyboards and concentrating all of their efforts on touchscreens. The majority of HTC’s hits have been touchscreen devices. It did release the HTC ChaCha last summer, which has a physical keyboard and a dedicated Facebook button. Unfortunately for QWERTY fans, the device’s reception was mediocre at best and that may have something to do with HTC’s decision to abandon physical keyboards altogether. While there are still a few holdouts that long for the touch of actual keys as they type, touchscreens and virtual keyboards have come a long way, and, overall, seem welcomed by the majority of consumers. Well then I know I won't be buying an HTC phone any time soon. Sorry, I know touch screen phones are thinner and that virtual keyboard are GOOD, but I still prefer the touch and feel of a physical QWERTY keyboard on my phone. I don't care about the extra size, I just like that I can type faster on a QWERTY keyboard. I guess I better get an HTC Arrive on Sprint, since it's currently the ONLY HTC phone on the network with a physical QWERTY keyboard. You remind me of the prototypical writer who couldn't live without his typewriter. Somehow, they adapted to the word processor world. Keyboards are going away -- due to speech to text like Siri or better handwriting recognition software (a la shorthand). My advice is to keep better care of your phone because the trend is simplicity and means fewer necessary parts like keyboards. I'm sure that at some point in the future, alternate means of entering text such as speech recognition will be better than using a physical keyboard. Right now, touch screen keyboards and speech recognition is definitely not there yet. If you want me to switch from using a physical keyboard, make technology that makes it easier for me to enter text. When that happens, I will gladly give up my physical keyboard. Don't force me to use technology that I consider substandard to a physical keyboard before that happens. You forgot to mention how great of keyboards they make though. They had the TouchPro 2 keyboard, which from what I've heard and read, was one of the best physical keyboards; and I have the Evo Shift and I love the physical keyboard, I can actually text/type faster on it than I can with the HTC keyboard or Swype. I guess that if smartphone, mainly Android devices, are going the way of the screen and doing away with physical keyboards, then I might just go back to a feature phone. Htc is missing out on a group of people like this:Business man and those who are tired of blackberries but still want a qwerty. Look at the droid 4.
it wasn't the keyboard that made the ChaCha so unappealing... -.- anyway i think there will always be a place for physical keyboards, just work on improving them too. maybe we can even get slide-out, touchscreen keyboards. Slide out devices add both bulk and design problems like hinges. It was common for me to see the demo units missing the screens since the hinge broke. That said, I do think the Kyrocero Echo or Sony clamshell tablet is making inroads to the traditional smartphone. If the Echo came with 4" screens rather than 3.5" screens, it would rival the Samsung Note. While I personally don't care for physical keyboards(Never could get used to them, keys too small...), there's obviously a market for it. I have a strong suspicion that if they made a slider version of the One S, it would be intensely popular. Well, if their last attempt to physical QWERTY was HTC ChaCha, maybe was for the best their retirement from this niche. Hunt3rj2: Let's call it One Z :) Definitely a device I would accept as a replacement for my Desire Z! Well, HTC just lost another customer. I've got a Touch Pro2 on the shelf, along with an Epic. The TP2 was a rugged beast and if it wasn't Windows 6 would probably still be in use. Android hacks have not been satisfying. The Epic is waiting for me to give up on my current phone, which I won, but does not have a keyboard. When you're reading texts and posts with odd spellings and wordings, you know what kind of keyboard ithey were created on. How many times do you see them and know the user, even if they were inclined to do so, just gave up on editing? nokia e6, there's a good keyboard. Aytch tee cee, dubbya tee eff?! The Evo Shift would have been a lot cooler if they had put better hardware in it, it was an all around downgrade from the original Evo and launched 6 months later. Im not sure if this is a good idea. We need diversity, i personaly dont like QWERTY infact i use a multitap t9 on my GS2, but i have come across many who are still holding on to their BlackBerrys, Htc Desire Zs, Nokia E7s, N900s, even E90s who just love the QWERTY keypads on their smartphones and want a QWERTY driven smartphone with dual-core, but outside the USA there arent many and those that are around are running on old HW e.g. the Desire Z, ChaCha, Galaxy Y Pro,E6, E7 etc... The one decent QWERTY smartphone around is the Xperia Pro as its getting ICS but even that can be hard to find. HTC has some amazing QWERTY smartphones in their past e.g. the TyTN-II Kaiser, Touch Pro, the fugly yet great Dream and even the Desire Z, they have/had the resources and know how to make a great QWERTY smartphone, not everyone wants a full touchscreen slab. NOoooooo !!!!!!!!!!!!!!!!!!!!!!!!!! I think I may be living with my Dell Venue PRo for the next few years.. thinking I may just have to go and shell out for a few "New" ones while I can still get them.